I have partnered with YMC and Armor All and have received compensation for this post. All opinions are my own. Every year, our family drives thousands of kilometers across Canada to visit family, and to explore this beautiful country. All told, that’s hundreds of hours in the car. I’d love to say that our car stays as fresh as a daisy on those trips, but that’s definitely not the case. Over the years, we’ve learned some helpful tips for keeping our car smelling clean and staying organized. 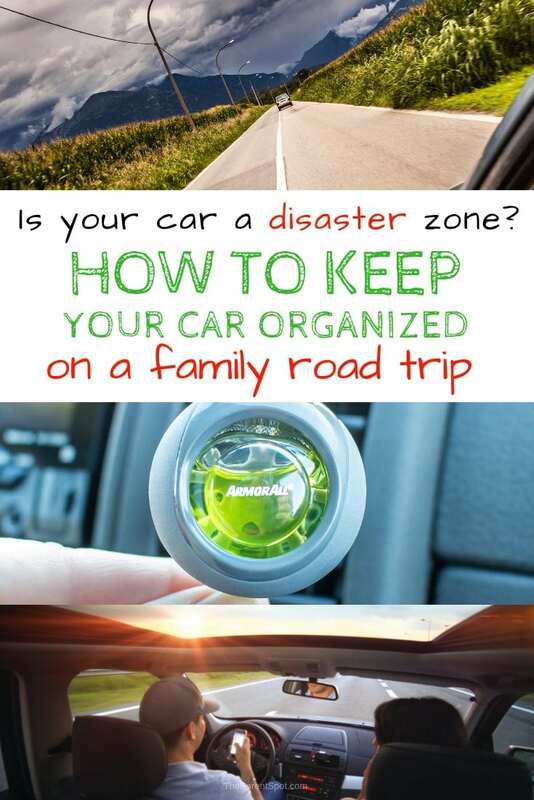 This article weaves the Armor All campaign messages into helpful tips for keeping your car fresh and organized on family road trips. Before any road trip, I take the kids outside and give our car a once over cleaning. We throw out any garbage, give the dash a quick wipe, and even vacuum if we have the time. That way, we’re starting our trip clean and organized, and it’s a lot easier to keep it that way. After days in the car together, it’s inevitable that our car’s going to be less than pristine, to say the least. I mentioned we have two kids, right? 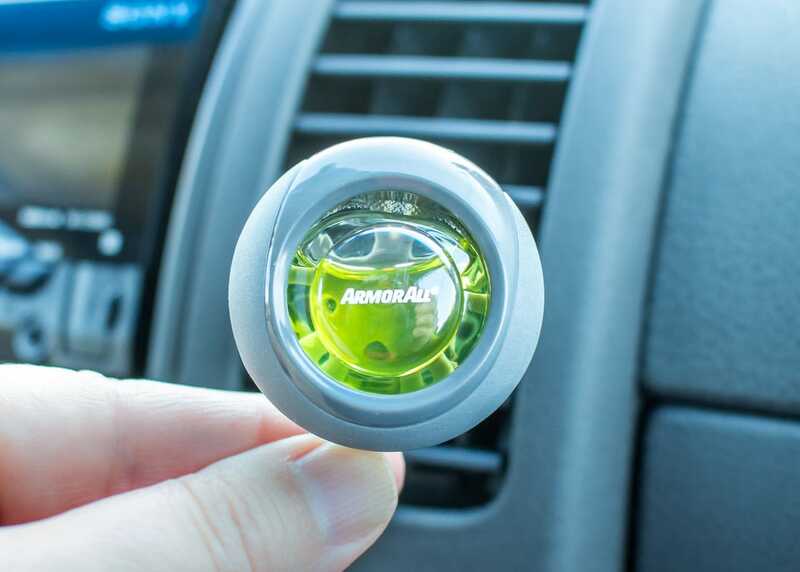 The gorgeous scents of Essential™ Blends air fresheners from Armor All are such a great choice. 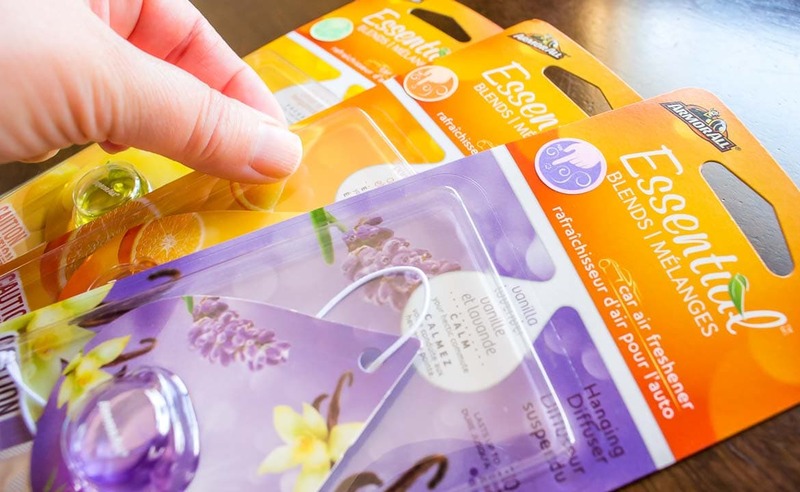 They’re made with essential oil scents like lavender, citrus pomegranate, pink grapefruit, eucalyptus mint, and lemon bergamot. It’s such an easy way take a break from sitting in traffic. 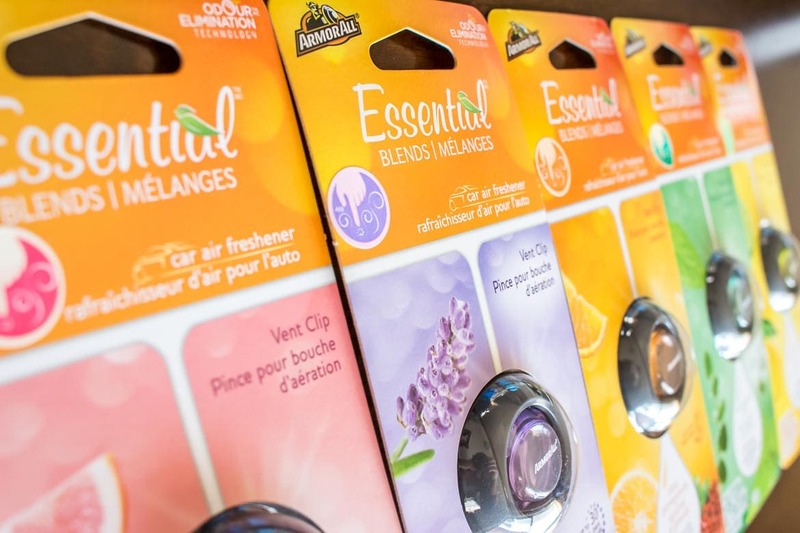 You can get the Essential Blends air fresheners in either vent clip or new hanging diffuser style at Canadian Tire. 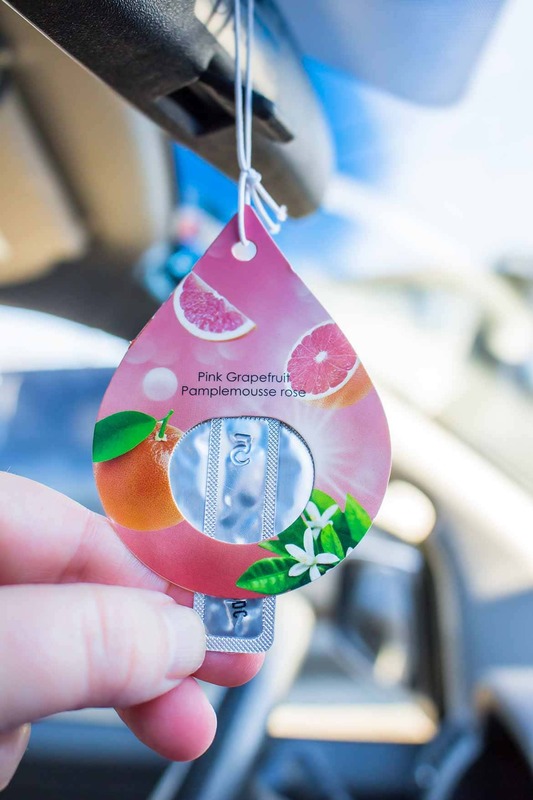 To release the scent, just pull the tab on the back, and voila, your car smells wonderful. 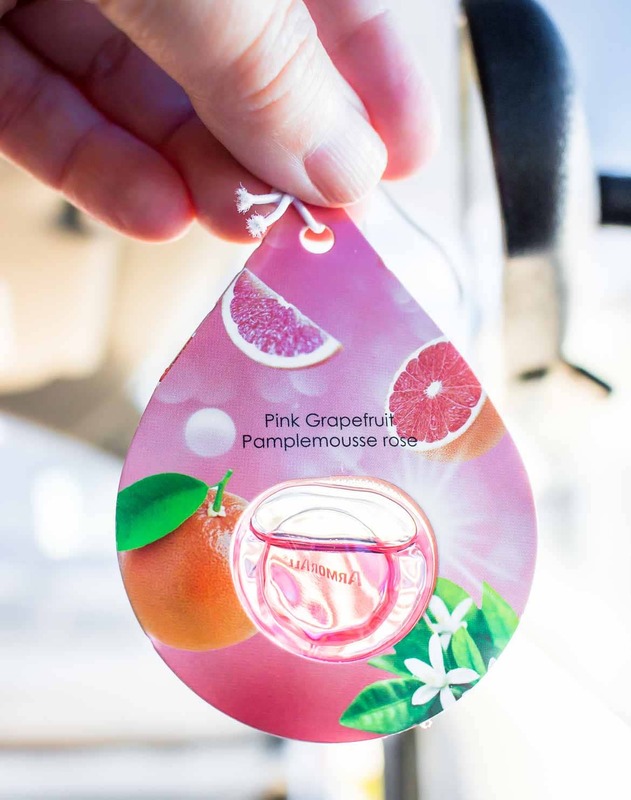 We really love the pink grapefruit and lemon bergamot scents! Check out the Armor All essential oil blends of Energize, Awaken, Refresh, Focus, and Calm here. Armor all has a great Escape Your Commute contest going on right now! 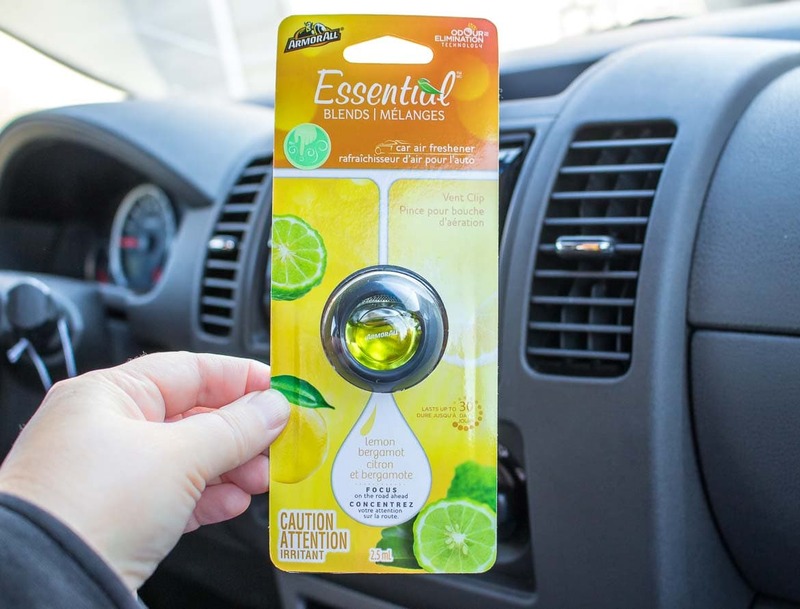 Frequency Essential™ Blends air fresheners! There are a lot of helpful products out there to help keep your car organized. A shoe organizer on the back of the front passenger seat is a good place to start, but you can get literally dozens of types of car-specific organizers. Stop by your auto supply isle to see what works for your specific car. We keep a soft cooler in the middle of the the floor of the back seat. It keeps all of the snacks in one place, and it’s easy for all of us to reach. All of our snacks go in the cooler, whether they’re cold or not. We use an ice pack to keep it cool, since it’s a lot less messy than ice cubes. Tip: We use sandwich baggies or individual bowls to hand out individual portions to cut down on the mess. Ideally, we’d never eat in the car,since it makes a huge mess, but long road trips mean an awful lot of time sitting in the car. Stopping to eat every meal just adds an awful lot of time to our drives. To keep our time on the road down, and minimize the amount of time we spend sitting in restaurants, we grab food to go and eat in the car. Unfortunately, that means a lot of garbage, and a lot of mess. We keep a garbage bag permanently in the car to dispose of trash as soon as we eat, keeping spills and smells to a minimum. Every time we stop for gas, or for a bathroom break, we empty the car garbage. 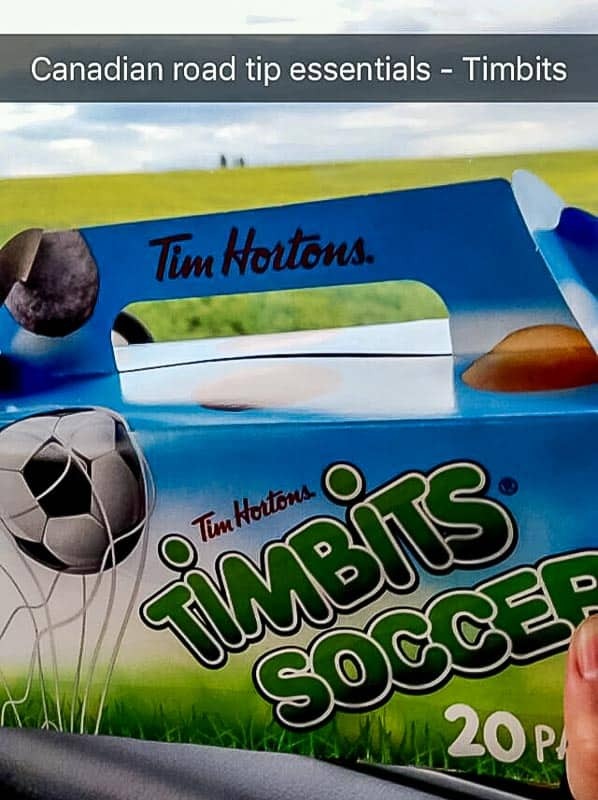 On top of that, we get everyone to grab a handful of wrappers, empty drink containers, and whatever’s near them as they exit the car. Any parent quickly realized that baby wipes are a miracle cleaning tool. Now that our kids are 13 and ten, we still keep a pack in the house, plus a pack in the car. Baby wipes are perfect for cleaning up inevitable spills, and they’re great for wiping dirty hands. 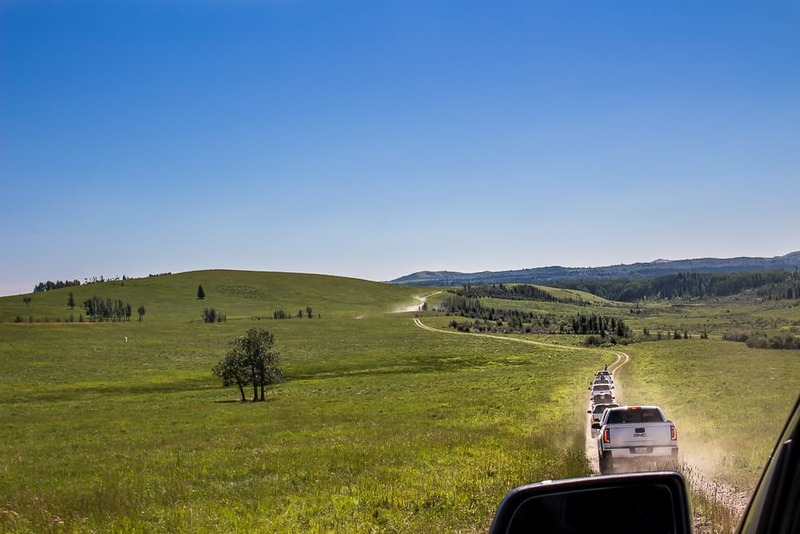 We travel a lot on dirt roads, and spend a lot of time hiking in the mountains, so it’s especially hard to keep our car carpet clean. We try to shake off our shoes every time we climb in the car to keep the mess to a minimum. Do you have any tips for keeping your car fresh and clean on a road trip? Let us know!